With this article we will try to help you with the decision on choosing the correct equipment for espresso drinks. Espresso drinks are beautiful drinks but espresso is sensitive and needs the right equipment in order to give consistent high quality results. This means you need to understand the factors that are involved in producing great espresso and we will try to explain here how to go about with this. As you can see the espresso machine is very important. Most espresso machines will do these things, some however do it better than others. One of the most important factors is the temperature of the brewing water. Imagine brewing a tea with cold water, it wouldn't taste any good. This applies to coffee just as much and especially to espresso. Most espressos are brewed with water of about 88 C to 95 C. Each blend/coffee will have a perfect brewing temperature. 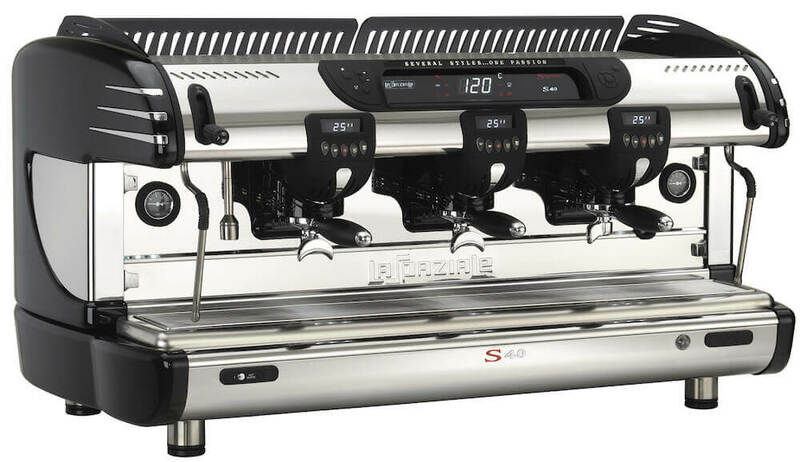 An espresso machine that allows the barista to adjust the temperature is ideal but it is more important that once set, the temperature is controlled. The temperature control in an espresso machine can be done in various ways. The most common way is a heat exchange system. This is where the cold brewing water passes in a separate water system through the boiler, usually upwards. The brewing water is heated by the water of the boiler on the way to the group head. The espresso machine can control the water temperature in the boiler by either a thermostat or a pressure stat. The pressure stat will measure the pressure inside the boiler and will simply turn off the heating element when the set pressure has been reached, for example 1 BAR. The thermostat will measure the temperature of the water. We believe that a thermostat produces better stability. Besides a heat exchanger an espresso machine can also use an independent boiler system. This is where each group has its own boiler. Many espresso machines have poorly designed independent boiler systems and will struggle to maintain heat during busy times so make sure that if you go with a system like this that it is well built. Some espresso machines use a dual boiler system; one boiler for hot water and steam and one boiler for all the groups. Boilers can also be controlled by a PID system which will significantly increase temperature stability. A PID system is a bit like cruise control and will keep the brewing temperature at a constant level as much as possible. There are espresso machines out there that brew directly from the boiler. Not something we would recommend as the water will most often be too hot to produce great results. 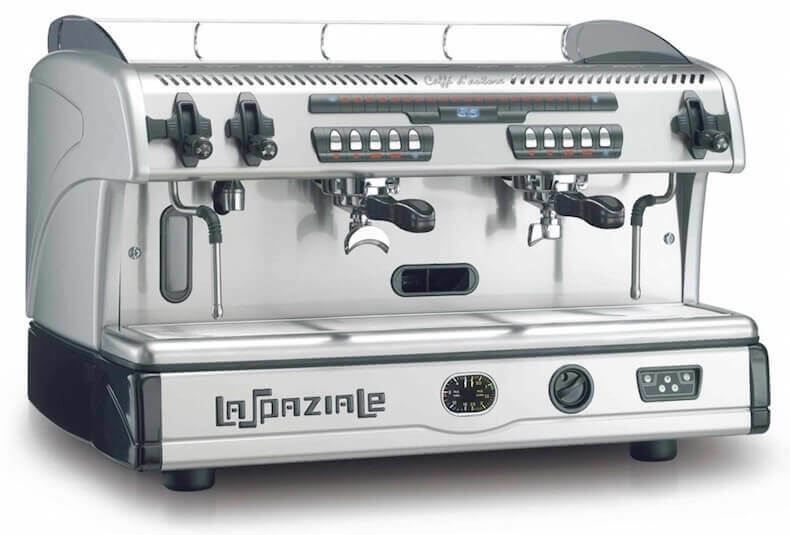 Some espresso machines use custom designed systems like the La Spaziale machines that we supply. La Spaziale espresso machines use the steam to heat up the water in the group heads. Our machines also have the option to include a so called ITC which stands for Independent Temperature Control. The ITC adds a certain amount of cold water to the brewing water. This gives the barista the option to control the brewing temperature and experiment until the ideal temperature has been reached. It also means the espresso machine can be run extra hot to give better steam and hot water. This can be done because the ITC will cool down the brewing water ensuring the extra hot espresso machine is not brewing espresso with water that is too hot. Quite a unique and brilliant system and at a very good price. So how many groups should you go for? 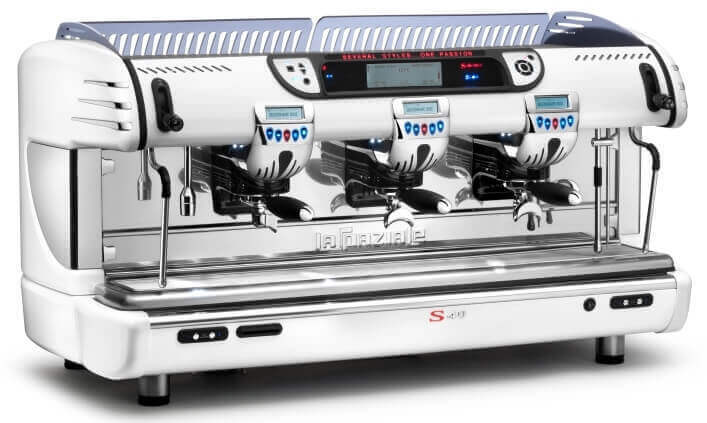 A single group espresso machine can use a single or a double handle, producing a single or a double espresso. The double espresso can be split into two single espressos. This means that you can make a single/regular coffee, a double/large coffee or two single/regulars coffees with one group. Basically one group can make two espressos, two groups four espressos and three groups six espressos at the same time. 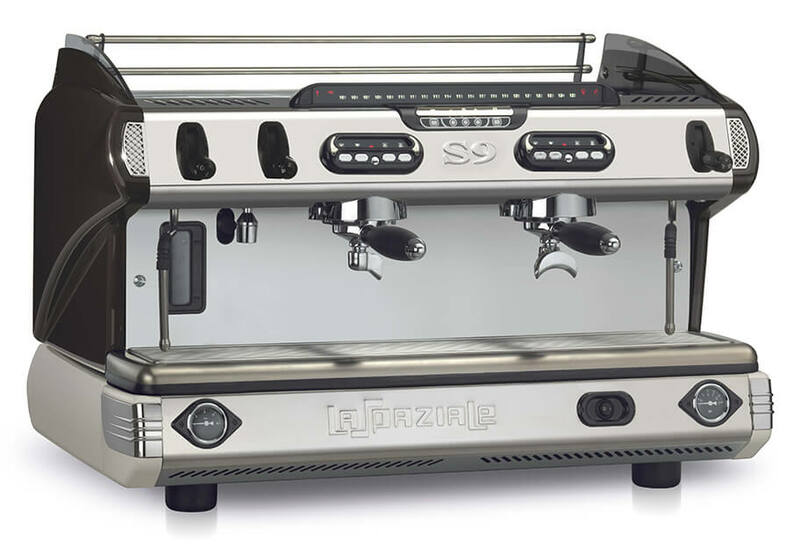 A single group espresso machine is only useful for small outlets like offices or small sandwich bars and restaurants. Most coffee shops will go for a two or three group espresso machine. It doesn't really come down to how many coffees you make on a day, it comes down to how many shots you want to be able to produce at the same time. If you have large cups as a standard or if you serve double shots for every drink then you might decide to go for a three group instead of a two group. If you serve single shots as a standard then a two group is usually fine because you will be able to make four coffees at once. A three group will be slightly more stable in temperature then a two group espresso machine. This is more in theory though, we haven't noticed a difference in real life to be honest. A three group machine will certainly have a larger reservoir for steam because the boiler is larger. You therefore also have a larger output of hot water at one time. Always be careful when using the hot water from an espresso machine. The more hot water you draw off the more the machine will loose heat. The boiler will be filled with cold water cooling the machine down again. Drawing off a little water is fine, but just bear in mind the temperature drop. Compact espresso machines have even smaller boilers, usually 5 litre boilers compared to 10 litre boilers in most two groups. A compact espresso should therefore not be used as a hot water boiler. A compact espresso has a smaller footprint which can be great when space is tight. The compact machines have small boilers and usually use less than 3kw allowing you to plug the machine into a 13 amps power plug. Because of the smaller boiler however you need to think about temperature control, hot water output and steaming. With a two group or three group machine you will be able to steam on both sides at the same time. The boiler is large and the machine holds a good amount of steam. A compact machine only has a small reservoir for steam and will run out of steam when steaming on both sides at the same time. You can usually pull espressos all day long with a compact machine. If you use a compact espresso machine to make a couple of coffees every five minutes or so it will be perfectly fine. It all comes down to how much steaming you have to do really. This means that you could easily do hundreds of coffees a day with a compact machine. If all these coffees are extra large lattes however then you might struggle. Larger machines often have a bigger impact on people than smaller machines. A big shiny red espresso machines with LED lights, steam and cool curves does actually makes a difference on how people feel about the quality of the drinks. Lets not forget that we buy with our eyes first. What power does an espresso machine use? Well, this will depend on the actual machine. Most single group espresso machines use less than 3000 watts in power. That means it can be run off a 13 amps plug (3000 watts divided by 240 volts is 12,5 amps). Even a lot of two group machines can run off 13 amps although they often require a larger socket such as a 20 amps. Big three group machines can usually also run off single phase 20 amps but might need a large three phase 32 amps socket. For more details we recommend you ask us and we will explain what power requirement you exactly need. How about the water connection and drainage? Espresso machine engineers can usually connect any machine to your water connection. Just make sure that you have a water supply with an isolator valve (on/off tap) within one meter from the espresso machine. This should ideally be placed directly underneath the espresso machine. Also leave room for a water softener. The drip tray from the espresso machine is connected to a drainage hose. This hose is usually inserted into a drainage pipe underneath the machine. If you do not have drainage then you can run the drainage hose into a bucket however it is recommended to have drainage. A water softener is very important. The softener treats the water to ensure that you do not get a build up of limescale inside the machine. Limescale is the number one reason for problems, number two is people not cleaning the machine properly. Espresso machines force water through small valves and jets. Limescale will block the passage of water causing all kinds of problems. It is not really possible to run a descaler through your espresso machine and descaling is therefore very difficult. Descaling often involves taking the machine apart and descaling the individual parts. You can image this causes down time and problems for your business. Therefore ensure that you prevent problems by using a quality water softener and replace it periodically, at least once a year. Automatic espresso machines have buttons that can be set to certain volumes, for example 20ml and 30ml. Usually automatic espresso machines have four buttons, one for a ristretto, one for an espresso, one for a double ristretto and one for a double espresso. The buttons can easily be programmed to any volume the barista desires however. Semi-automatic espresso coffee machines require the barista to judge the shot volume. The barista has to look at the extraction and decide when the extraction needs to be stopped. Semi-automatic machines have the advantage in that there is less to go wrong machine wise. However, it is more dependent on the barista doing a good job. You can also decide on a manual espresso machine. Manual machines use the old fashioned hand pull levers. The barista pulls the lever down and releases or pushes it back up to extract the coffee. Big advantage here is that the espresso machine doesn't need a pump making it very reliable. Some manual machines produce fantastic coffee, others very poorly. If this is a route you would like to take then please ensure that you make training a big part of your routine. How important is the steam? We think it is very important because most of the drinks you produce will be made with an espresso and steamed milk. The power of the steam is important. A machine that doesn't give enough steam power will not produce perfectly steamed and textured milk. The power is needed to force the air bubbles densely into the milk and also, more importantly, to swirl the milk around. The swirling of the milk is very important as it will mix the air bubbles better in the milk. Some espresso machines produce poor power and therefore make it harder to create good foam. A professional barista should be able to make beautiful coffee on any espresso machine, but ideally you want a machine that works with the barista, not against them. The angle of the steam is important as well. There are espresso machines out there that do not spin the milk very well because of the angle of the steam. It is also important that you can freely move the steam wand around yet you don't want the steam wand to be too loose as it might move during the steaming of the milk. The ability to move the steam wand at different angles makes it easier for the barista to find the correct angle. The amount of steam tips makes a difference as well. Four hole steam tip will result in more powerful steaming than a three hole steam tip. How many steam tips you need might depend on what you prefer. Turning on the steam by a lever or a dial makes a big difference. A lever allows the barista to turn the steam on to full power in a second. Two hands can then be used to hold the milk jug giving much more control over the texturing of the milk. A dial is slower and not too good for the wrist if it has to be turned on fast and a long way. A dial also causes a delay in turning on the steam to full power and also when turning the steam off. This delay means that barista can not hold the jug with two hands all the time. That said, some baristas actually prefer a dial over a lever. We don't. 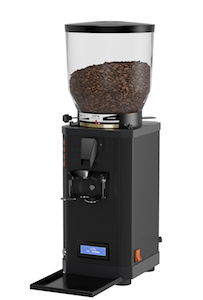 One of the most important factors is whether you go for a grind on demand coffee grinder or a doser grinder. A grind on demand grinder grinds the coffee only when it is needed and will grind for a set amount of time to give the correct dose. Why is this so important? Grinding fresh on demand is so important because you need fresh coffee for espresso drinks. Of course you need freshly ground coffee for all coffee drinks but especially for espresso. Espresso contains crema which is a foam made up off gases and oils. Fresh coffee contains more gases and these gases are needed to create the crema. Once coffee is ground it starts releasing gases very quickly. Minutes will make a difference. The fresher the coffee the more gases are contained within the ground coffee. The gases are forced out of the ground coffee and into the liquid by the pressure. The oils in the coffee then form a layer around the gas bubbles creating a foam which we call crema (cream in Italian). Fresher coffee creates more crema. The crema also depends on the coffee that is used and the roasting method has a big impact on the crema as well. Lighter roasted coffees contain less gases and oils then darker roasted coffees. Crema is important as it contains a lot of aromas and adds to the texture of the drink. Therefore it is so important that you grind fresh for each and every drink. Grind on demand grinders therefore are popular with us here at Limini. We believe they produce the best coffees. The other type of grinders are so called doser grinders. Doser grinders store ground coffee in a dosing chamber at the front. The doser has pie shaped compartments which move around by pulling a lever. One compartment is empty at the bottom and this is where the coffee falls out into the group handle. The barista fills the dosing chamber with ground coffee and moves a lever to move the compartments around. Usually one pull for single shot and one pull for a double shot. The problem with this system is that the ground coffee is often not ground fresh for every drink. Some dosing chambers hold over 30 coffees and the ground coffee is often kept overnight which is just a real shame for those customers in the morning who deserve much better. Good grinders make very small changes to the grind. The better the grinder the smaller the adjustments. The grind size mainly controls the speed of the extraction. Lets say that you like your coffee best at an extraction of 26 seconds. If the extraction is taking 24 seconds then with a good grinder you will be able to make a small adjustment and reach that perfect extraction time. A grinder that is not so great will make big adjustments and you may never be able to get to the perfect extraction time. This is extremely important. Most grinders use steps to adjust the grind and one step can often be five seconds different. A grinder with micro adjustments are much better. The better the grinder the better you can control the dosage. The dosage that is used for coffee is extremely important. If the dosage is too low then the extraction will not be any good as the coffee will swell up too much during the extraction loosening the puck. Use too much coffee and the water will struggle to pass through the coffee. Once you have found the correct dose you want a grinder that can give you this time and time again. Grind on demand grinders control the dosage by time. The more accurate you can control the grinding time the better. Usually these grinders have two buttons, one for a single and one for a double dose. The option to grind continuously is a great option as well. It is important that a grinder is grinding fast but at the same time not making the ground coffee too hot. Poorly designed grinders can give out very warm ground coffee and this certainly affects the flavour of the coffee. Wide grinding burrs often produce better coffee. You also want a grinder that doesn't produce big clumps. A fluffy consistent grind is ideal usually. We hope all of this has helped you with your decision on espresso equipment. It is strongly advised to make an appointment with one of our trainers. Come and see us before you make a decision. Our trainers can demonstrate the equipment to you and explain in more detail the futures of the equipment. We look forward to hearing from you. Hi Limini Coffee, Please contact me regarding equipment.